Steering system faults can range from sloppiness in the helm, vague handling, and increased fuel consumption, to catastrophic binding and complete failure. The potentially crippling errors illustrated below were made by reputable builders and service yards. They should give Professional BoatBuilder readers a chill. Steering rams and tie-bars between rudders equipped with non-rotating clevis fork-and-eye type fittings will work without binding only when the system’s geometry remains parallel and perpendicular. Even slight angularity will cause the clevis ends to bind. Bronze or stainless steel spherical bearings—sometimes called rod-ends—are a fix that, if properly set up, can tolerate lots of angularity. But having the right bearings is not enough. If hardware and rigging are not correct as well, binding or failure can result. I first encountered this issue while working on one of two twin-outboard-powered fishing boats I’ve owned. When I bought the first boat I wondered why the rigger had left the rod-ends’ jam nuts off both ends of the steering tie-bar. I marked the threads carefully to maintain the rod-ends’ positions, removed them, added jam nuts, and put it all back together. When I decided to see if the boat would plane on a single engine, I found I couldn’t raise one engine completely out of the water before the spherical bearings ran out of travel, and the hydraulic steering began to twist the solid stainless tie-bar. Although the original rigging had been wrong, omitting the jam nuts had allowed each rod-end to rotate, which eliminated the tie-bar twist I noted. Eliminating those nuts also permitted engine vibration to rotate the tie-bar, changing the engine’s toe-in setting: a poor installation. Since then, I’ve always paid extra attention to the rod-ends on steering systems. 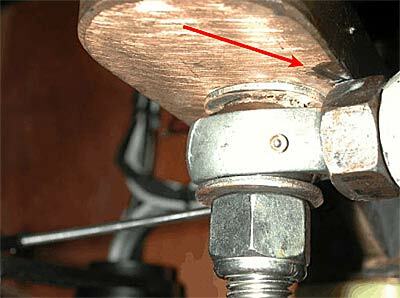 If a steering-system bolt is meant to pivot, it should at least have a washer under its head. 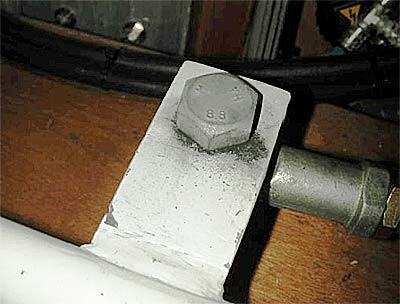 Black debris is a sure sign of trouble, whether the bolt is meant to rotate or not. On this boat I noticed black stains around the steering-system fitting. Things looked fine from above, but underneath the steering arm I found problems. Although the spherical bearing itself had enough angularity to accept variable geometry as the steering cycled from lock to lock, the bearing had been rigged so that its housing fetched up against the steering arm and the washer under the elastic stop nut before full designed steering travel was achieved. Perhaps leaving the bolt loose in the installation shown here was an attempt to mitigate binding, but it’s wrong nonetheless. 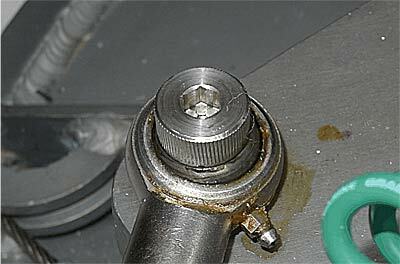 The bolt through the ball of a spherical bearing should always be tight; and it should be a shoulder bolt—not a fully threaded one—so it fits tightly in the ball’s bore. The red arrow indicates where the rod-end housing bound up against the bronze steering arm. The setup shown here is almost the reverse of the one shown above, but is also wrong. The head of the hex-drive bolt is so small that without a washer it will not retain the crossbar’s rod-end ball in an overload situation. Although I’ve never seen them in stainless steel, special conical bushings/washers are available from racecar parts suppliers. Conical bushings space spherical bearings away from their attachments, so they can achieve full angular travel without having the housing bind. Some automobile race-sanctioning bodies require larger-diameter, extra-thick “ball-retention washers,” so some connection remains even if a ball pops out of its housing. 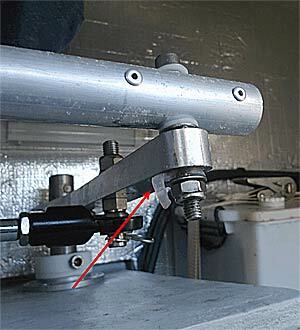 A similar application would allow for greater angular travel on marine steering systems. 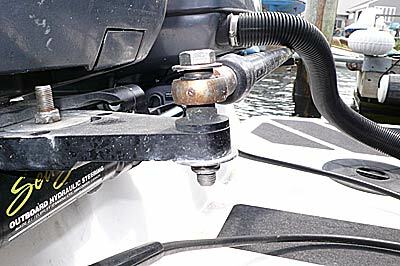 Rather than rig this twin-rudder steering system with proper rod-ends, the builder installed resilient sleeves of soft clear vinyl tubing between the bores in the steering arms and the crossbar’s pivot bolts to provide adequate angularity. It probably worked until the vinyl tubing failed. The photo was taken when the boat was just a few months old. Although the large-diameter washers would prevent the bolt from pulling out and completely disconnecting the steering when the vinyl bushings failed, this part of the steering system needs to be fully reworked. If only slight angularity is required in a steering system, tough rubber or urethane bushings with vulcanized metal sleeves—rather than pricier spherical bearings—might get the job done; but I don’t particularly like them, as they’re difficult to inspect without disassembly. I’d rather have sensitive steering than a few extra dollars in my pocket any day. This nice tie-bar end setup includes spacer bushings above and below the rod-end ball to permit full angular travel, and a large escape-prevention washer. The only minor problems are that the spherical bearings at each end of the tie-bar are not correctly aligned, which prevents them from rotating through their full range.